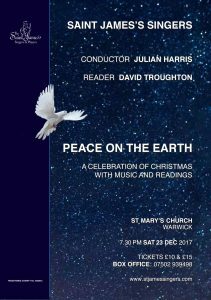 The St James’s Singers present Peace on Earth – a celebration of Christmas with festive music and readings which will take place on Saturday, 23 December at St Mary’s Church, Warwick starting at 7.30pm. David Troughton is our Reader this year. David has had a long and illustrious career with both the RSC and the Royal National Theatre. His numerous television roles include Outnumbered, Doctor Who, All the King’s Men, A Very Peculiar Practice and New Tricks. He also continues to play Tony Archer in the long running BBC radio series, The Archers. This year he has been much in demand at the RSC, playing the title role in Titus Andronicus and Falstaff in the Merry Wives of Windsor. Readings will include some inspiring poetry from Milton, Wordsworth, and the more modern Brian Patten and U A Fanthorpe, together with prose to capture the spirit of Christmas and to bring a smile to all. 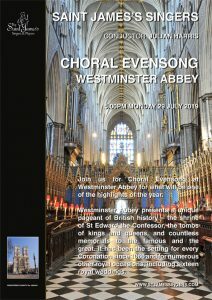 The music will include a blend of familiar and less well known carols, including several favourites for the audience to join in. 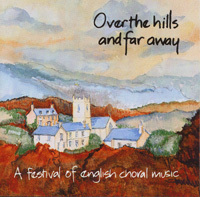 The choir’s pieces include haunting works by Peter Warlock and Herbert Howells and an absolutely beautiful Russian piece – Oche Nash by Kedrov.